Peptic ulcers also called duodenal ulcers, gastric ulcers, and stomach ulcers, are most commonly caused by the infection of bacteria known as H pylori. This infection leads to the formation of sores, or ulcers, in the first layer of the protective lining of the stomach. The development of these sores, or lesions, can lead to many symptoms. The most common symptom associated with peptic ulcers is a pain or burning in the stomach. This pain is usually located between the navel area and the breastbone and is most apparent when the stomach is empty of food. The pain can vary in intensity, and is sometimes described as a stabbing pain, a dull ache, or a burning sensation. If the ulcer is located in the duodenum the pain will usually develop anywhere from three to five hours after a meal, or during the middle of the night when the stomach is at its most empty. The pain caused by this type of stomach ulcer is usually relieved by the consumption of food. However, the pain from a gastric ulcer will develop soon after consuming a meal and is made worse by continued eating. In both cases, the pain can last anywhere from a few minutes to a few hours and will come and go over a period of days or weeks. Along with the expected pain of an stomach ulcer many individuals also experience a variety of other symptoms. Other common peptic ulcer symptoms include weight loss, loss of appetite, nausea, vomiting, and a general ill feeling of the abdomen. Weight loss and the loss of appetite can be caused by the tendency to avoid food or eating since consumption can make symptoms worse. 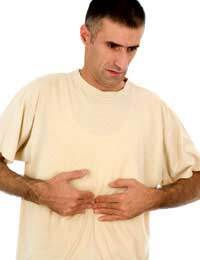 Nausea and vomiting are attributed to the ulcer lesion and excess acid in the stomach. In some cases individuals may also experience feelings of fullness, abdominal bloating, increased belching, sensations of food regurgitation, shortness of breath, fatigue, and anaemia. The hidden bleeding associated with some peptic ulcers causes anaemia, and the loss of blood can lead to general weakness and feelings of tiredness. If the condition is allowed to progress it can cause low blood iron levels, shortness of breath, heart palpitations, dizziness and fainting. Aside from the more common symptoms of peptic ulcers, there are a few symptoms that can develop that require immediate medical attention. The development of any of these symptoms could indicate a more serious complication, such as intestinal perforation, intestinal obstruction, or haemorrhage. These symptoms include the presence of blood in vomit or stool, increased or more severe vomiting, increased or more severe abdominal pain, pain that radiates to the back, and difficulty swallowing. Since the most common symptoms of a peptic U can be mistaken for or confused with the symptoms of other disorders, such as gallbladder disease, gastroesophageal reflux disease, liver disease, and even heart attack, it is important to have any symptoms checked by a doctor. Only after a proper diagnosis about your ulcer has been made can accurate, effective treatment be started. I av ulcer and I feel tiredness, dizzy, pain under my left breast ? Is it still a sign of ulcer ? We are unable to give a diagnosis on symptoms given over the internet. You would have to visit your GP to find out through examination. I have chest pain in my left chest ,sometimes I have pain under the armpit. am just fiftten years of age.I do HV some heart palpitations and shortness of breath and pain which radiate to the back I went to the doctor he said am having peptic ulcer due to overuse of painkillers drug he also said I should go for ECG which I did and the result said Atrial abnormality but the doctor said the ECG result might not be true.I have anxiety problems too.so the doctor gave me drugs for the peptic ulcer and said I should calm down and no to be afraid av used the peptic ulcer drug finish but I still have the ulcer and the chest pain,please help me am really afraid. I just want to be happy and live a good life.pls help me. We can only encourage you to continue to seek advice from your GP (doctor), as we cannot give an online diagnosis. If you have anxiety problems, they can also result in pains in your chest because of the way you breathe and the constant tension. Some breathing exercises or yoga classes may help you to relax a little and then you may find some of your chest pains may begin to subside. I have chest pain in my left chest ,sometimes I have pain under the armpit... am just fiftten years of age.I do HV some heart palpitations and shortness of breath and pain which radiate to the back I went to the doctor he said am having peptic ulcer due to overuse of painkillers drug he also said I should go for ECG which I did and the result said Atrial abnormality but the doctor said the ECG result might not be true....I have anxiety problems too ...so the doctor gave me drugs for the peptic ulcer and said I should calm down and no to be afraid av used the peptic ulcer drug finish but I still have the ulcer and the chest pain,please help me am really afraid.... I just want to be happy and live a good life...pls help me. I do have serious palpitations at night especially when I go to bed early, after diagnosis, we found out its ulcer, does ulcer cause palpitations , feeling of fainting and noise in the head? I do experience cramping in my belly and if i beat d lower part of my chest wit my handi feel shivering inside nd i do hv sharp pain under my chest nd sensational movement in my body nd i feel like i hv a wound under my chest level, if i lay down i do hear my hrt beating fast wot could it b pls? Please does Peptic ulcer make one to breath fast and causes chest pain too? If yes, what are the drugs i can buy to treat Peptic Ulcer? I get burning sensation around my chest. sometimes it radiated to my side (under the armpit. I get sharp pains too. I get tired very easily. sharp pains under my breast bone especially the left side wc I also feel on the same sode in my back and aomeyimes my shoulder. and I get palpitatipions. sometimes I feel my heart beat goin up tp 110bpm and then I hv sjortness of breath. my Gp is treating me for ulcer. could dis be it? I'm afraid we are unable to give medical advice. Your GP is the best person to do this and he/she will be able to examine you and make a diagnosis directly. i get burning sensation around my chest. sometimes it radiated to my side (under the armpit. i get sharp pains too. i get tired very easily. sharp pains under my breast bone especially the left side wc i also feel on the same sode in my back and aomeyimes my shoulder. and i get palpitatipions. sometimes i feel my heart beat goin up tp 110bpm and then i hv sjortness of breath.. my Gp is treating me for ulcer. could dis be it?